Seismologists have tentatively pegged the source of yesterday's 6.5-magnitude earthquake that destroyed the landmark building in the town of Paso Robles and killed at least two people. The fault zone, located in coastal Central California and known as the Oceanic, lies offshore and in the Santa Lucia mountains, north of the town of Cambria and near Hearst Castle. The U.S. Geological Survey (USGS) posted the epicenter of the San Simeon earthquake today, after it struck at about 11:16 am local time, on Monday, Dec. 22. The Oceanic fault zone stretches from Vandenberg Air Force Base in the south to the Golden Gate Bridge in the north, and was first documented and named by Marcia McLaren (Pacific Gas and Electric) and William Savage (USGS) in 2001. 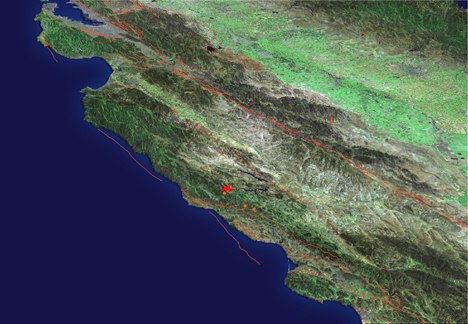 Image of the California coast, with San Simeon earthquake epicenter pinpointed with a red star; the Oceanic fault zone runs parallel to the San Andreas Fault, which is marked by the orange lines farthest inland and extends north toward the San Francisco Bay, in the upper left. Graphic by Serkan Bozkurt (USGS). The most recent earthquake of similar magnitude in the region was magnitude 6.2, in November 1952. Other similar earthquakes occurred in the region in 1853 and 1906. "It's not a highly seismic area, but surprisingly active," says Ross Stein, a seismologist at the USGS in Menlo Park. The fault zone's large earthquakes tend to be from reverse faulting, versus the strike-slip faulting of the nearby San Andreas Fault, 60 kilometers away from yesterday's epicenter. Because of the proximity to the San Andreas, researchers immediately looked to see where other seismic activity occurred and if the San Andreas responded in particular. The strongest remote signals were from aftershocks to the southeast, away from the rupture plane of the Oceanic fault zone. Because local earthquakes tend to scatter, Stein says, previous work has been unable to map a defined fault plane. Since the fault is likely thrusting and probably broke the surface when it ruptured, the earthquake should have uplifted the coastal range about a foot or so, Stein says. He also noted that the Parkfield segment of the San Andreas Fault registered one or two millimeters of creep, but whether the San Simeon event set off the San Andreas remains ambiguous. That Parkfield segment normally creeps 17 to 20 millimeters per year, Stein says, "so that's a couple of week's worth of creeping." It could, however, simply be soil movement following the wave front. Stein says that the bigger beast is the nearby Hosgri fault, which remains a candidate source for the San Simeon earthquake and which is relatively unknown. McLaren and Savage determined that the fault zone transfers motion to the Transverse Ranges, a series of mountains with faults at right angles to the north-south trending San Andreas and others. If the Hosgri is the host fault, then larger aftershocks could be possible and the San Simeon may only be a taste of what's to come. "There's always a likelihood that this could end up producing something larger," Stein says. "Even though we know it's not likely or probable, it's still quite possible." For more information on the San Simeon earthquake, visit the USGS website: http://earthquake.usgs.gov.